Continuing with their expansion of existing kit families, DML has now released a commander’s model of the Marder III Ausf. M SP antitank gun. This variant comes with an enhanced radio suite but basically is the same as kit No. 6464 with the new parts added. This kit comes with even more brass than the standard M variant and it must be used to construct the model. Some of the frames and grilles will require a good amount of “origami” to shape so it is recommended that the modeler have a good bending jig like a Hold’n’Fold or Etch-Mate on hand. This kit still includes the engine and other interior parts from the DML TNHP series kits While the directions are typical DML and as obtuse as usual, they are better about indicating what is optional and what it should look like in either position, such as the engine access hatches. The suspension is similar to that of the Tristar kits with each bogie assembly consisting of nine parts. A “doormat” type matting is provided for the floor of the fighting compartment. The driveline and interior are mostly styrene parts, such as the transmission/clutch assembly, steering controls, driveshaft and shield. The ammo racks are all molded as groups of tubes and dummy half rounds are provided to simulate a loaded tube. This kit now fits four radio sets into the right side of the casemate and as with all current command variants by all manufacturers provides no cabling instructions. Each periscope in the fighting compartment is all stryene (clear prism component, grey mounts) and may be positioned as folded or erected. This kit offers only two different finishing options: 1./Pz.Jg.Abt. 346, 34th Infantry Division, Holland 1944 (red-brown outlined green patches on sand, red 101) and Pz.Jg.Abt. 243, Normandy 1944 (tricolor, red 100). A small sheet of “targeted” Cartograf decals is provided. 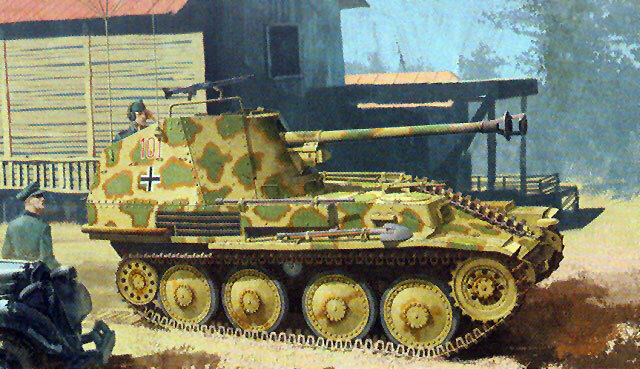 Overall, this is another Marder III option and one which can be made very “busy” without much extra work.